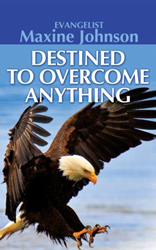 Evangelist Maxine Johnson’s new book, Destined to Overcome Anything, ($9.99, paperback, 9781625099273; $4.99, e-book, 9781625099280) encourages readers to understand that God still delivers – they will always be overcomers in Christ – no matter what the circumstance. The author explains that problems and troubles are only a testing of one’s faith in God. He is not going to leave his followers in the midst of challenges. She reminds everyone that even when a person doesn’t understand what He is doing, one needs only to trust God and He will deliver on time. This optimistic book was written to change a reader’s thinking for the better, which in turn will certainly influence his or her life in a truly positive way. “I hope my readers will internalize that they are born to overcome anything; that God is with them,” states the author. Evangelist Maxine Johnson holds a doctorate in Divinity and an extensive background in counseling. She is the CEO and founder of the Maxine Johnson Deliverance Ministry. She credits writing this book to her impressive 35 years of being an Evangelist operating in the Deliverance ministry and the Pastoral. She has a hunger and thirst after righteousness, and her sole mission in ministry is to seek the lost, at any cost, in getting them to know Christ. She is a woman of great excellence in every aspect of her life and committed to doing the will of God with vigor, strength and might. She is considered armed and dangerous for the Lord. Natives from around the globe have been touched by the message of faith and God’s love through her ministry, the servant, and the pioneer. This is her second published book. She is also the proud author of Coming Back From A Set Back. Xulon Press, a division of Salem Media Group, is the world’s largest Christian self-publisher, with more than 15,000 titles published to date. Retailers may order Destined to Overcome Anything through Ingram Book Company and/or Spring Arbor Book Distributors. The book is available online through xulonpress.com/bookstore, amazon.com, and barnesandnoble.com.